AquA AnimaniA is your #1 local source for pet foods plus a wide variety of live pets, birds, small animals, fish, amphibians and more! To properly care for your pets, we also carry a comprehensive and extensive line of pet supplies including live foods, habitats, treats, toys and supplies for dogs, cats, birds, small animals, amphibians, fish, exotic pets and critters. 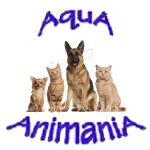 AquA AnimaniA is your #1 local source for nutritious and healthy foods and supplies for your fish, amphibians, birds, dogs, cats, small animals and other exotic pet critters! AquA AnimaniA has a wide variety of healthy live foods for your land and exotic pets. While some critters and fish will usually take feeder fish such as comets, guppies,and Rosey Reds, mealworms, crickets as well as other large insects. Fussy bottom feeders, such as spiny eels and mormyrids, will usually eat superworms, silkworms and other insect larvae. HBH began in 1988 as a plastics fabrication company. One area of expertise was custom built tanks and filtration. As aquarium hobbyists’ we found ourselves tinkering with innovative ideas. Then, as our interest and experience in the pet market continued, an opportunity to formulate and develop a revolutionary line of fish foods presented itself. We began with just four foods in 1991, but have quickly grown over the last decade into one of the leading producers of aquarium foods. From the aquarium hobbyist to the first time pet owner, we proudly offer quality products at an excellent value.HBH continues to grow and expand into new markets. In 2004 we introduced a new line of dog-safe chocolate flavored treats. We have been met with an enthusiastic response from our customers and consumers. This benchmark development has led to the expansion of our research team and entry into new markets for all animals. In 2008 we introduced our new line of grain-free pet treats which has been continuing to grow in popularity.We take great pride in each of our products and subject each one to a broad spectrum of testing before it’s released into the market. Each product represents an animal and each animal represents an owner. As pet owners and animal lovers, we understand the special bond that exists between a pet and its owner. Our overall goal at HBH is to ensure the enjoyment of pet ownership as well as maximize the energy, health and life span of pets everywhere. Pets make life better, so we try to return the favor by making their life better.Accordingly, we offer products for just about every type of aquatic animal, including a large selection of species-specific diets. In fact, our Betta Bites® fish food has been the best-selling Betta formula on the market for over a decade. We have Bites® foods for a broad spectrum of animals including goldfish, turtles, frogs, hermit crabs, and more. In addition, we offer the only pellet foods specifically designed for the delicate digestive systems of newts, salamanders, and fully aquatic frogs and tadpoles.One of our trademark attributes at HBH is our drive toward innovation, creating numerous species-specific diets, unique products, and advances in technology. Each year we introduce new and exciting products and often improve our existing ones. We hope that this continued drive has benefited you as the consumer, and are always open to ideas and suggestions.Our goal is to keep your needs continually in our crosshairs as we expand and grow both our line of products and our ability to serve you. We hope to grow the ever increasing amount of people making HBH their supplier of high quality products. Through your support HBH will continue to revolutionize the industry, and bring a little more joy to you and your pet. As the leader in Bird and Small Animal nutrition and care, Kaytee takes pride in a commitment to the animals we love. Kaytee carries this same dedication and commitment to excellence with them as Kaytee participates in and hosts various community outreach programs! Kaytee understands that “Doing what is Right” means understanding and fulfilling the needs of both you and your pet. It’s the original home of LM Farms™, a family originated business that loves pets, and loves taking care of them. That’s how we got started, making food for small animals and birds. We made what we needed, the rest we sold. People seemed to like it, so we made more. Over time we decided to cook up recipes for small batch treats, natural food supplements, grooming blends and more. We get as much of the stuff we need from as close to home as possible – fresh from folks we know and trust. This is what makes our products so alive with natural goodness. There are a few basic ideals in which we believe at LM Farms™. They should tell you everything you need to know about us. The simple things, the honest things, are still the best. We believe the best things in life are grown on a farm. Our pets are outdoors all day – they work and they play hard. The products we make, we make with our pets in mind – they deserve our very best. Many of the mass-produced products you buy are made without heart, soul or conscience. We do our best to put all those values into our products. Whenever possible, your pet’s products should be made in small batches, with someone watching the pot. Our products are not over-packaged; we believe that simple packaging is best for you and the environment. Our recyclable packaging not only looks good but it also maintains product freshness. There are a few farmers around the country who still do things the old-fashioned way, and we buy as much of their fruits, meats and vegetables as we can. We don’t like crowds. There are fewer than 200 people who live in Pleasant Plain, Ohio – which is where you can find us and our values. At Nutrience, we use only the healthiest and most nutritious ingredients in our food. If it’s not good for your pet, you won’t find it in our Nutrience products. Nutrience foods contain no by-products. By-products are parts of animals other than meat (much too unappetizing to list here), which can be used in pet food. They are a cheaper source of protein than chicken or chicken meal, but they are also inferior ingredients that are harder for your pet to digest, and provide less nutrition. Nutrience foods do not contain fillers, and instead chooses high-quality ingredients for its formulas. Eating large volumes of food containing fillers also means more clean-up in the yard! Fillers are not dangerous, but are virtually useless ingredients in a food. These pass right through your pet, giving him very little nutrition. Fillers bulk up a food and help your pet feel satisfied after a meal, but since they contribute less to his nutrition than quality ingredients, he will need to eat a bigger portion of the food to meet his caloric and nutrient requirements. He eats more, you buy more; you both are better off buying and consuming less of a higher-quality food. Nutrience foods contain no added glutens. Glutens are used in many pet foods as an additional source of protein that helps a food meet its minimum protein requirements. Glutens are a cheaper source of protein than meat, but they are also less digestible than meat protein and don’t provide your pet with as many benefits as meat protein. Nutrience foods contain no artificial colours or flavours. Why add artificial colours and flavours to food? These ingredients make food more appealing and palatable, and can help your pet enjoy his meal. But studies on humans have shown that some artificial colours and flavours can be bad for your health. At Nutrience, we believe that nature has provided all the colours and flavours we need for our pets’ food and our own. Nutrience does not split ingredients. Ingredient-Splitting means dividing a single, less nutritious ingredient into parts so that it falls lower on a pet food’s ingredient list. Some companies do this to maintain a desired ingredient as number #1 on their ingredient list, or to disguise how much of a particular ingredient – often a grain such as rice – is in their food. At The PEDIGREE Brand, WE’RE FOR DOGS. Some people are for the whales. Some are for the trees. We’re for dogs. That’s why we make really good food for dogs in a flavor and a variety to please every dog and puppy: dry kibbles, wet food in cans and pouches, and snacks and treats. The PEDIGREE Brand makes food for dogs that offers balanced nutrition and irresistible flavor. PEDIGREE Food for Dogs is available in dry, wet, and treats. At PEDIGREE Food for Dogs, everything we do is for the love of dogs. That’s why we developed recipes based on research from The WALTHAM Centre for Pet Nutrition. Our improved dry recipes provide leading nutrition to address the Four Universal Needs of Dogs. Skin & Coat: Our dry recipes have been formulated with zinc and leading levels of linoleic acid to help keep your dog’s skin and coat healthy and strong. Oral Care: 4 out of 5 dogs over age three may develop periodontal disease. * So select PEDIGREE Brand dry recipes for adult dogs feature an Oral Care kibble that helps clean teeth down to the gum line. Digestion: We have an improved blend of fiber in our latest dry recipes to support a healthy digestive system and help your dog absorb more of the healthy things we pack into every kibble. Immunity: Our dry recipes have been formulated with enhanced levels of antioxidants—like vitamins E and C—to help keep your dog strong where it really counts. Our Ingredients: At PEDIGREE Brand, we welcome label readers because it’s important for you to know what you’re feeding your dog. Take a look at some of the healthy ingredients we use in our recipes, their nutritional benefits, and the dog health needs they address. About WALTHAM®: For almost half a century, The WALTHAM Centre for Pet Nutrition has led the world in advanced pet care research. WALTHAM research in dog nutrition and health is incorporated into PEDIGREE Food for Dogs. Make the Switch: With leading levels of antioxidants, vitamins E & C, linoleic acid, and other healthy and nutritious ingredients, we know you can’t wait to get your dog started on one of the improved PEDIGREE Dry Food recipes. Just follow the simple steps in this interactive guide. Adult Dog Food: Nutritious and delicious canned and dry dog food to please adult dogs of all breeds and personalities. Puppy Food: Get your puppy off on the right paw with our specially formulated puppy foods, developed to fuel his growth and development. Senior Dog Food: Older dogs have special dietary needs. Our Senior Dog Food products were developed with the high-quality protein and vitamins dogs need during their golden years. PEDIGREE Dry Dog Foods: Our best dry food ever, developed based on research from the WALTHAM Centre for Pet Nutrition to address the Four Universal Needs of Dogs. PEDIGREE Wet Dog Foods: Savory and meaty meals with irresistible flavor and balanced nutrition in every can—many of which contain enhanced levels of linoleic acid to promote healthy skin and coat. Treats for Dogs: Good-for-your-dog treats that provide important vitamins, promote fresher breath, and help control tartar buildup. DENTASTIX® Treats: Clinically proven to reduce up to 80% of tartar buildup when used as part of a daily oral care routine. Weight Maintenance: Recipes that are lower in fat, calories, and carbohydrates for dogs that are overweight. Hip & Joint: Specially formulated recipes that help promote joint health and mobility, which is what some senior dogs and large-breed dogs may need. Oral Care: Oral health issues are the most common health problems reported in dogs, so we developed a variety of oral care dog snacks and dog foods. Our patented Oral Care kibble helps clean teeth down to the gum line. Skin & Coat: Dog foods and dog treats with nutrients that help promote healthy skin and coat, your dog’s first line of defense. The Pro Plan brand was founded on a commitment to nutritional expertise because we know that giving your pet the best possible care is very important to you. We can relate. We’ve shared in the joys of pet ownership as well; the exuberant greetings, the understanding eyes, the never ending loyalty of pet companions touch our lives every day. Feeding Purina Pro Plan brand Pet Food is one of the ways you can help your pet have a beautiful life through high-quality nutrition. By serving Pro Plan with its nutritional extras, like protein from real meat, poultry, or fish, and high levels of antioxidants, you’re helping to support your pet’s overall health and bolster his or her protective system. But, leading a truly fulfilled life goes beyond the science of nutrition. Purina Pro Plan also provides a wide variety of formulas, ingredients, tastes, and textures to appeal to your cat or dog throughout all life stages. Regardless of your pet’s age, body condition, or activity level, there’s a Pro Plan product that’s perfectly suited for the one who does so much for you. Let us guide you through the selection process. Bright, happy eyes, a shiny coat and a playful personality are the telltale signs of any healthy dog and cat, and it all starts with a proper diet. Purina is leading the way when it comes to advancing the science of nutrition, health and food products for dogs, puppies, cats and kittens of all ages. At Nestlé Purina PetCare Company, we’re passionately committed to making pets’ lives better. As the pace of change in pet care accelerates, our challenge is to lead with fresh, innovative approaches to making the lives of dogs and cats better. We are proud of our heritage, and we are constantly exploring new trends and ideas that define the future of pet care and of Nestlé Purina. We know firsthand the joy that dogs and cats bring to life. Pets occupy our hearts, our minds, our homes—you’ll even find them at our Purina offices. We never tire of enriching their lives, as they enrich ours. That’s why our top priority is the quality of the food that nourishes not only your pets, but the pets we share our lives with. Rest assured that when it comes to feeding your pet food from Purina, you’re feeding quality food that’s made to our high standards. Ingredient Sourcing: Purina ingredient sourcing and processing meet or exceed FDA, USDA or AAFCO standards for pet food. Every supplier of ingredients for Purina products must meet our stringent standards for ingredient specifications, product safety, sanitation and manufacturing practices. Ingredient Testing: All of Purina’s North American manufacturing facilities have on-site quality assurance laboratories and staff. Purina is expanding the use of technology to further screen ingredients for quality assurance. Ingredient Tracking & Control: 99% of all Purina pet food products sold in the U.S. are made in Purina-owned U.S. manufacturing facilities. Purina’s sophisticated tracking system ensures important measures of control: All raw ingredients are tracked from time of receipt at our plants, through their inclusion in finished products, and on to retail stores. Obviously, we take great care making the Purina food enjoyed by your pet. (After all, it’s the same food we feed our pets.) Because in the end, pet care isn’t just our business, it’s our passion. Dog nutrition is all about finding the right balance. Your dog’s size, age and energy level are a huge part of their unique personality. They’re also the reasons that every dog’s nutritional needs are different. Here you’ll get the important information you need to find the perfect balance for your special friend, including food facts, vitamins and minerals, aging, and allergies and obesity. Your relationship with your cat is unique. Your cats size, age and energy level are a huge part of their unique personality. They’re also the reasons that every cats nutritional needs are different. No one understands that better than Purina® brand Cat Food, which is dedicated to helping cat owners get the most out of life with their cats. Whether your pet is a kitten, adult or mature cat, Purina brand Cat Food offers you a wealth of healthy options! Give your dog the meaty taste of today’s Purina brand Dog and Cat Foods. Our complete line of delicious wet food, crunchy dry food and tasty treats is sure to make your dog’s face light up with excitement. Today’s Purina feeding instructions: Measure, serve and get out of the way! Royal Canin is not your average pet food company. Since Dr. Jean Cathary founded Royal Canin in 1967, we have been forerunners in health nutrition because we do things differently. We were different when we produced the first diet exclusively for large-breed dogs. Different when we developed Persian 30, the first diet tailor-made for a single breed. And different when we launched the first nutritional program for indoor cats. The needs of the pet are the motivation behind everything we do. Our knowledge is the result of collaboration with veterinarians, breeders and nutritionists around the world to find out what the pet needs. Since we better understand the pet, we can develop the best products to meet its specific morphological, physiological and nutritional requirements. At Royal Canin, it’s about the Knowledge and Respect for your pet. Over 150 veterinarians, food scientists, technicians and Ph.D nutritionists at Hill’s develop Science Diet and Prescription Diet brand pet foods to meet the needs of your pet when it’s well or when it’s sick. Each ingredient is analyzed to ensure its safety when included in the food your pet eats. We analyze our products’ ingredient profile for 50 nutrients to ensure your pet gets the stringent, precise formulation it needs. Ingredient Supply: We inspect every ingredient via microbiological, sensory, chemical or foreign matter testing to give you peace of mind when you feed your pet. Only ingredient suppliers whose facilities meet stringent raw material quality standards are approved by Hill’s. Every location for every ingredient supplier is separately qualified to ensure consistency in ingredient quality. Product Manufacturing: Product quality is continuously monitored and electronically documented through on-line quality checks throughout the manufacturing process. We demand compliance with current Good Manufacturing Practices (cGMP) and Hill’s high quality standards, so your pet’s food is produced under clean and sanitary conditions. Finished Product: We conduct final, daily safety checks on every Hill’s Science Diet and Hill’s Prescription Diet pet food product to help ensure the safety of your pet’s food. All Hill’s pet food products are screened for metal detection and foreign material prior to release. All finished products are physically inspected and tested for key nutrients prior to release to help ensure your pet gets a consistent product bag to bag. We can also locate other pets, products and supplies from our vast network of national and international partners and suppliers!